I was blogging so regularly, and then I got thrown off! Nick’s visit, the ensuing let down, and then the cold he brought with him and gifted to me have really not allowed for much knitting. But, today was productive, and I can finally see progress. The poor grover jacket has hit this total stall. I am SO BORED with it. It goes much slower than I expected, and so I can’t seem to get too enthused. I’ve picked up stitches for the sleeve and started it. I am about at the elbow, not quiet. 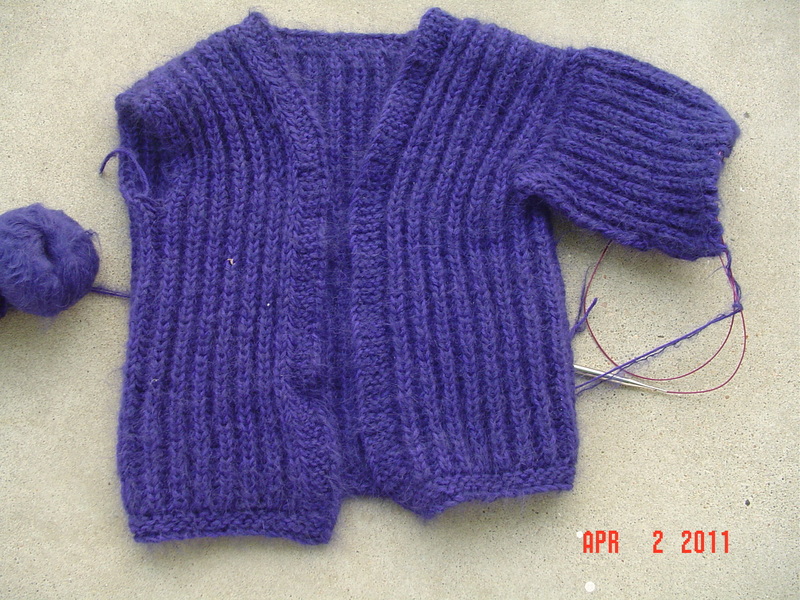 I have one more decrease before straight knitting to the end. 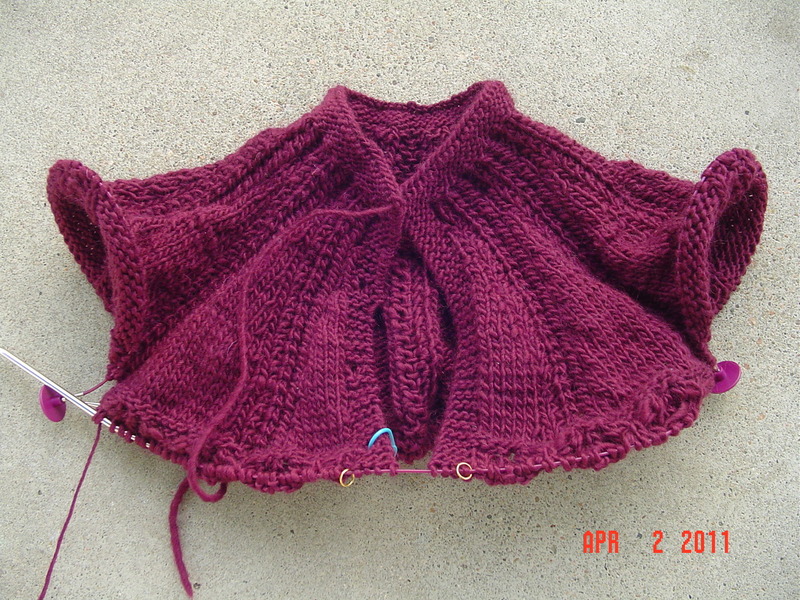 The majority of my progress has been on the sunburst cardigan, I’ve split for the sleeves and begun working the sunburst pattern. Since I’ve knit this pattern a number of times now, it was the easy mindless knitting I needed while I nursed my sore throat and stuffy head. But there was still a great deal of sitting around doing nothing. 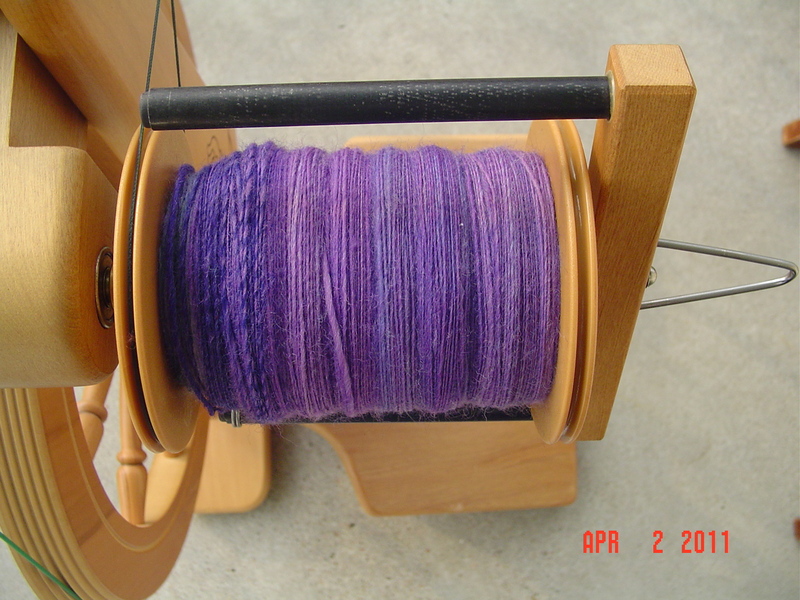 During the week, I did manage to finish spinning 4 oz. of falkland wool. This is a gradient dyed wool from dyeabolical, and so I spun it all and navajo plyed to keep the transition from one end to the other. I’ve caught a picture before plying, I’ll have a plyed and dried pic tomorrow. It was a beautiful 70 F out today, making the weather seem like the beginning of spinning on the porch season. Very pleasant!